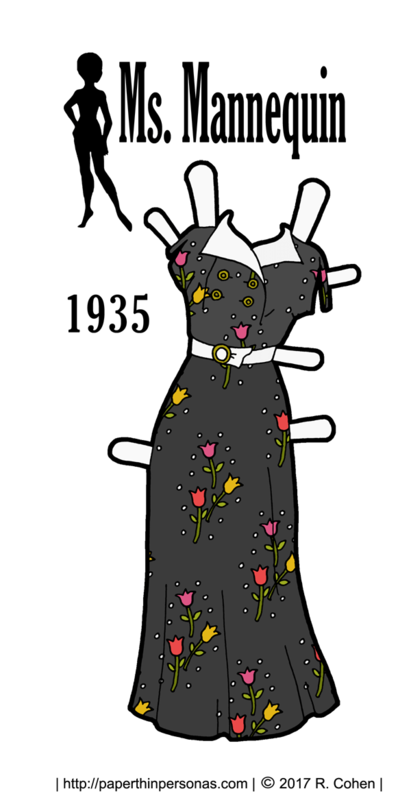 This is only the second historical paper doll outfit I have ever made for the Ms. Mannequin series. My last one was my second foray into Viking dress. This is a bit more current and I do think the paper doll’s pose works better with more contemporary fashions (if you can call the 1930s contemporary) than it did with Viking looks. I suppose contemporary is really just a matter of point of view. What I liked about the pattern cover that inspired today’s paper doll dress was the split sleeves and the wide white collar. Confession time: The dress fabric pattern is way out of scale for what was common in the 1930s, but I found this amazing pattern swatch from the V&A and I just had to use it. The tulips felt so modern and contemporary. Obviously, I heavily adapted the pattern, so it was more of a jumping off point than anything else. Part of what I wanted to do was a spring dress in black which isn’t a color usually associated with Springtime fashions. What are your favorite spring colors? I love corals and yellows. Let me know in a comment. Meanwhile, if you like the blog, then consider donating through Patreon, plus there’s a behind the scenes blog and early paper doll previews and other fun content. Also, you can follow it on Facebook where I am sharing past paper dolls I love from the archives of PTP. The flowers may be a bit large for the time period, but I think it works better for this scale. And my favorite spring colors are new leaf green and carnation pink! That’s a really beautiful pattern. I think adjusting the size was the right choice. This feels like something a retro enthusiast of today would wear as well as being a historical dress. The black & brights palette is very striking! I am really pleased at how the pattern came out on this one. Nothing feels more like spring to me than daffodil yellow and bright grass green. It just seems so sunny! Even though I don’t use those colors for my own needs(clothes, decorating, etc) I still like to see them. I really love the bright colors against the black in this. So pretty! I always think of daffodils and springtime. There is something about seafoam that I just love. beautiful! the tulips are lovely! p.s. i love daffodils best of all!